One year after joining Hughston Clinic Orthopaedics, surgeon Tiffany Feltman, DO, is changing the lives of patients ... one case at a time. The Birmingham native first arrived in Nashville as an undergrad at Vanderbilt University. She soon headed to Georgia to attend the Atlanta branch of the Philadelphia College of Osteopathic Medicine. 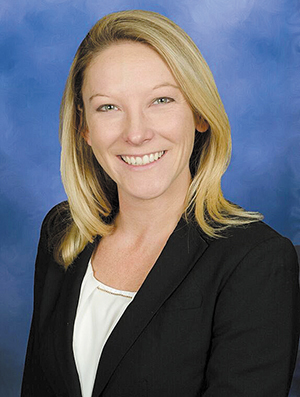 Following an orthopaedic surgery residency in Philadelphia, Feltman sought out a practice where she could make a difference, which brought her back to Middle Tennessee. "I wanted to find a private practice that wasn't already saturated with board certified adult reconstructive surgeons," Feltman said. "I wanted to be somewhere I could bring something new to the practice. After meeting with the Hughston physicians, I just felt it was a good fit." A nationally recognized orthopaedic group with offices throughout the Southeast, Georgia-based Hughston Clinic partnered with Nashville's Premier Orthopaedics & Sports Medicine in 2016. Today the group represents more than 70 physicians including 23 in Middle Tennessee. Feltman specializes in joint revision, joint replacement and adult reconstruction. "When you see adult reconstruction patients, they're the most excited before surgery and ready for the change," Feltman said. "Two weeks later they're walking better than they've walked in years and spending time with grandkids. It puts patients back into their original lives. It brings instant satisfaction to make such an immediate impact, and that's been really touching." Revision patients include those who have had total join replacement in the past but continue to experience pain or infection. "I like to find out the reason why and fix it," Feltman said of unwinding the mystery. "If someone needs revision surgery, then I'm going to try my best to make them better." She also has a passion for working with younger dysplasia patients, often in their mid-20s. "These are patients around my age who had some kind of congenital abnormality or severe arthritis growing up, and being able to do something to get them either where they don't have to have total hip replacement immediately or get them back to normal everyday life is very rewarding," she said. Such patients - often otherwise healthy - are often not diagnosed by primary care providers in original exams. It isn't unusual for Feltman to be the second or third physician to see and ultimately diagnose them. "Dysplasia patients are often put off a little because sometimes normal X-ray views don't show dysplasia," said Feltman, noting that a special view can be required for diagnosis. Fortunately, age allows most dysplasia patients to bounce back quickly, returning to their normal lives pain-free. Feltman often reminds patients that not every visit to an orthopedic surgeon's office results in surgery. "It's a common misconception for people to think that if they go to an ortho they'll have surgery," said Feltman. "In reality we err on the conservative side and try to avoid surgery unless it's the last line." A year after joining Hughston Clinic Orthopaedics to help change patients' quality of life, Feltman made a significant life change of her own. In September she said "I do" to her fiancé, Nate. The newlyweds can be found running, biking or kayaking around Nashville's parks and lakes with their three dogs.